UPC DISCOUNT ALERT: NEW BOSTON ROUND BULK DISCOUNTS!!! NEW @ UPC: Safely Store Your Credit Card At Checkout For Future Online Purchases! NEW LOWER UPS RATES IN EFFECT! ​UPC BOTTLE OF THE DAY! Our offices address: 35 Engel St., Hicksville, NY 11801. Our offices are open Monday thru Friday from 9am to 5pm EST. We are closed are on Saturday and Sunday. We ship your order in the order it was received. 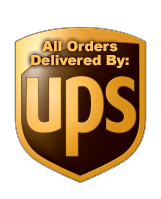 We use UPS for Shipping. They do not deliver to PO Boxes. If you have any questions, please contact us. All prices are in USD. | © 2019 UPC Packaging. | Sitemap | Thank you for visiting UPC-Bottles.com.